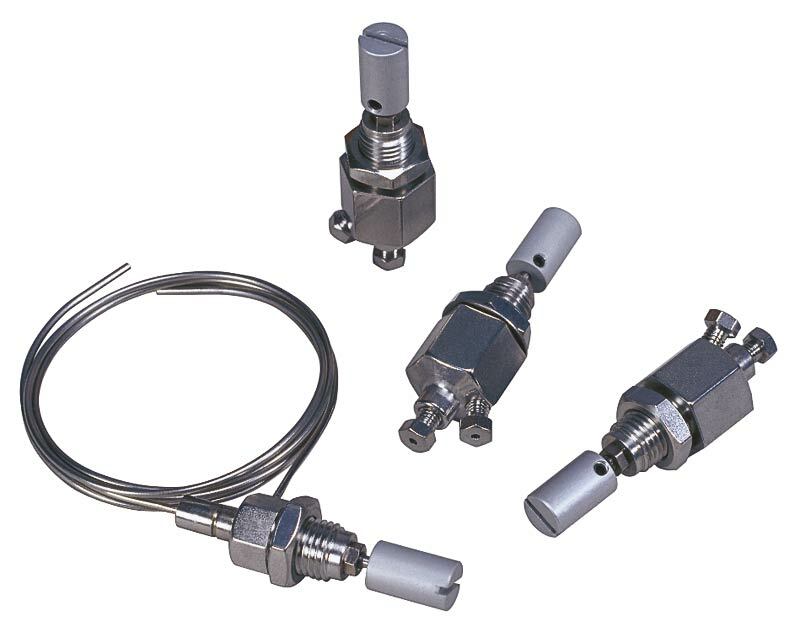 Micrometering (needle) valves combine the ease of connection associated with Valco zero dead volume fittings with convenient bulkhead mounting. The very low internal volume and precision design make this valve ideal for use as a gas control valve in chromatographic systems. Dual outlet versions eliminate the need for a tee in some applications. The Viton® model is rated at 225°C, while a version with Kalrez seals is capable of continuous operation at 315°C. This allows a needle valve to be mounted directly within a heated oven, facilitating control of flow switching in multidimensional systems while keeping the gases at oven temperature. Valves are rated for maximum of 1000 psi gas, and individually tested on a mass spectrometer leak detector to a helium leak rate specification of < 1 x 10-8 atm cc/sec. The standard model has 1/16" Valco ZDV fittings with one or two outlets. There is also a single-outlet version with 1/16" x 18" tubes. Select a model below to view product numbers. Please note: these are not designed for complete flow shut off. If positive shut off is required, we recommend a Valco combo valve, designed with a separate knob to shut off the flow without affecting the flow rate setting. The unlubricated versions with a specially polished seat were designed to be used with our pulsed discharge detectors, and should be used upstream of any ultrapure gas system. Please note that these are not designed for complete flow shut off. If positive shut off is required, we recommend a Valco combo valve, designed with a separate knob to shut off the flow without affecting the flow rate setting. It is possible to provide as many as six outlet ports. Contact us for more information.